Bear Call Spread - What Does It Mean? 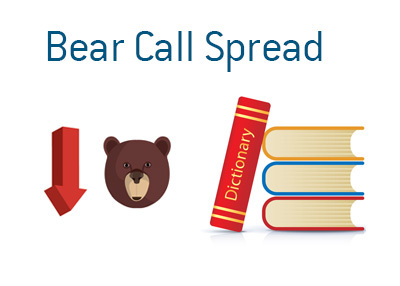 What is the definition of a "bear call spread"? What is meant by a "bear call spread"? With a "bear call spread", an options trader is betting that a stock is going to either trade sideways or lower over the length of the options combination. To enter a bear call spread, a trader sells a call at a lower strike price and then sells a call at a higher strike price. This creates a credit, which means that the trader will receive the proceeds of the trade immediately into their account, minus commissions. Maximum profit is realized if the underlying stock closes under the lower strike price at the time of expiration, and maximum loss is realized if the stock closes at or above the strike price of the call option that is purchased. Let's take a look at an example to further illustrate this point. Facebook is trading at $120 per share and you believe that it is going to either reverse or trade sideways for the next month. You decide to enter into a bear call spread - heading into this trade, the nature of the bear call spread means that your maximum profit and maximum loss are both defined before you enter the trade. You immediately realize a $1.60 credit ($2.70 - $1.10) for this trade. Your maximum profit is $1.60 * 100 = $160, which will be realized if FB closes at or below $125 on July 21st. Your maximum loss is $2.40. In order to figure out your maximum loss, subtract $130-$125 = $5, and then subtract the amount of your credit ($2.60).